For once I actually got to an exhibition close to its opening date rather than turning up just as it’s about to shut down, but John Singer Sargent has always been one of my favourite painters and I wanted to get there as soon as I could. So yesterday, on a sunny Sunday afternoon and undaunted by no trains running on our line due to planned engineering works we braved alternative means of transport (OK, the bus and tube) to get to the NPG. 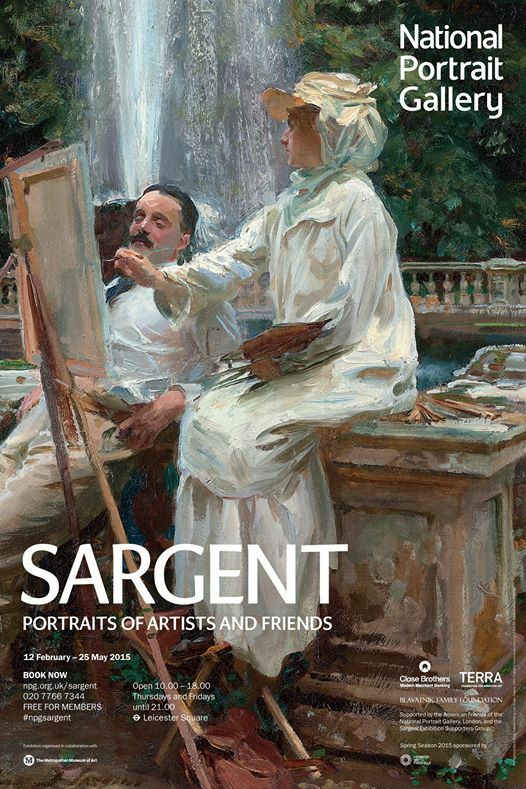 I was particularly interested in this selection of Sargent’s work because of its focus – Portraits of Artists and Friends – so we weren’t looking at the society portraits for which he became renowned but works, commissioned and otherwise, of other artists in a variety of fields from painting to theatre to music to literature. It was a wonderful chance to see paintings I’d seen rarely or on through reproductions, and it was a real delight. I would have lingered s bit longer but the exhibition was packed and it was also *whispers* a bit warm in the galleries but I may very well go back again to savour my favourites, especially the magnificent Ellen Terry as Lady Macbeth. Sargent: Portrait Drawings showing drawings in pencil, charcoal and pastels and just beautiful. Oh and before we went to the exhibition we had a peep at The Real Tudors, a fine collection of portraits in a free display, brought together in advance of an extended exhibition in Paris. The fact that Wolf Hall has been on stage recently and currently on TV made this very popular as well. Much to enjoy.